For the second straight year, Mark Newhouse will take a seat at poker's most prestigious final table when the November Nine commences in Las Vegas. Newhouse accomplished the unthinkable in July by becoming the first player since Dan Harrington (2003-2004) to make back-to-back final tables at the World Series of Poker Main Event. The difference, of course, is that the fields Newhouse had to navigate were exponentially larger than they were a decade ago. Last year, Newhouse entered the November Nine "nervous and excited" as the short stack, and his appearance was short-lived after eventual champion Ryan Riess knocked him out in ninth place. Newhouse is taking a different approach this time around. He's having fun, playing his game, and using the knowledge he soaked up last year to put himself in a position to win the whole thing. A good example of Newhouse's winning mentality came on the bubble of this year's Main Event final bubble when he found himself in a tough spot against his friend Luis Velador. Newhouse was kind enough to sit down with PokerNews and talk through the key hand that helped burst the bubble and secure his seat at the final table for the second straight year. Blinds: 200,000/400,000 with a 50,000 ante. Bruno Politano raised to 900,000 from middle position. Newhouse called from the button with the , and a short-stacked Velador moved all in for 6,150,000 from the small blind. Action folded back to Politano, and he tanked for about two minutes before he elected to fold. Newhouse sat back in his seat, thought it over for a minute, and called for roughly one-third of his stack with his small pair. PokerNews: This is obviously a crucial decision on the bubble. Talk us through your thought process here. Newhouse: I was actually hoping Bruno would ship so I wouldn't have to be involved in the situation (laughs). It was about another 5,000,000 to call and the blinds were 200K/400K ... I think in any other tournament situation not the November Nine bubble with a pocket pair it's a pretty easy call in that spot. It doesn't cost me a lot more and I'm getting a pretty good price. He could very easily have two overcards or even like ace-rag or a smaller pair. In this particular situation, he might be shoving a little bit tighter just because of what it is. But me and Luis are also friends so he could also maybe think that I'm not going to bust him. That could be something going through his mind where he could shove a little wider. That was something that actually went through my mind: "Wow, I don't want to bust him. I don't want to be the one." Normally everyone roots against the short stack 10-handed, but I was rooting for him because he's my friend. But we're all playing poker and we still have to make the same decisions. If I had lost the hand, it would have hurt me, but another part of what went through my mind was, "We're all tired, so let's get this over with." That was part of it. From a chip-EV standpoint, it's definitely a standard call. On the Main Event final table bubble it might be a little thin ... I don't know the math. It was close either way, and I decided to go for it. Velador flipped over the . Newhouse had Velador drawing thin, and the higher pair held up through the board. Velador was eliminated in 10th place and Newhouse climbed to exactly 26,000,000 in chips. 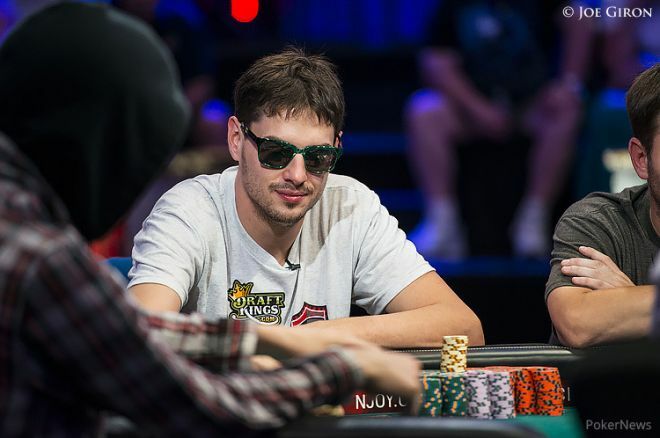 PokerNews: How important was it for you to make the final table two years in a row? How did that affect your decision? Newhouse: This year is so much bigger than last year, although this year I didn't really feel the pressure that I did last year. Last year I was very nervous and excited, and this year I was very relaxed and having fun the whole time. I just wasn't thinking about the final table and trying to play the best I could. Obviously it would be very disappointing if I didn't make it, but the more you think about that stuff the more you pressure yourself. It's going to affect your game and hurt you. You have to cut off from all of that and try to focus on playing. PokerNews: You finished ninth last year. Were you trying to put yourself in a better position to finish higher this year? Newhouse: This year throughout the entire tournament I had more chips than I did last year. At one point last year on Day 7, I was chip leader but that did not last very long. This year I was feeling much more comfortable and I am in a much better positon. Last year [before the final] table I told myself, "Whatever happens, happens. I won't be disappointed. I won't have expectations." But in reality I was very disappointed to finish ninth. This year all I know is I absolutely refuse to finish ninth. For more on Newhouse, check out his November Nine profile here at PokerNews. And be sure to watch for more November Nine strategy articles and interviews leading up to the final table!